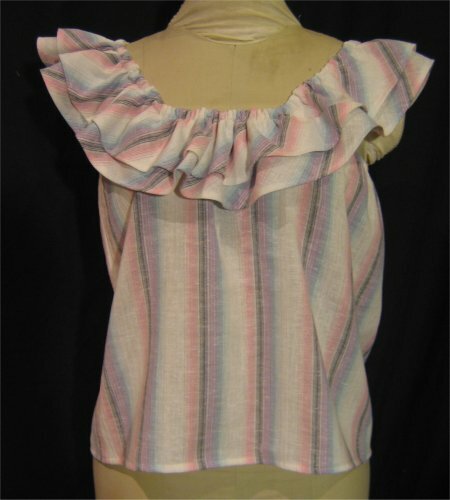 This was a free peasant blouse pattern at Sewing.Org, but it's not there any longer. Basically, this is a tube with an elastic casing at the top. Two bias-cut ruffles are bound together with their own, separate elastic casing. The ruffles are then sewn to the center front/back of the bodice tube. It was very easy to construct. There was a drawback: there is no fabric from the armpit to the center front/back so that your bra will show. Given that society's standards of proper dress has been severely relaxed, they may not deter some people, but it was definitely something that needed to be fixed for me. Also, as the center front goes over the bust, the fabric is pulled up so that the hemline slants from center front downwards towards the center back. Solution: instead of cutting a rectangle as the directions show, you need to add about 4" at center front and then angle center front edge to the center back edge. If you don't have an ample bustline, this may not be a problem for you.